My thanks to NetGalley, BookSparks, and Ballantine Books for sending me an ARC of this book in exchange for an honest review. All opinions are my own and are not influenced by the publisher. Daisy Jones and The Six is the story of the rise and fall of a fictional rock band from the 1970’s. For fans of The Seven Husbands of Evelyn Hugo, Daisy Jones will feel somewhat familiar as a protagonist. An absolute icon in the entertainment world, gorgeous, and stubborn, she is haunted by an all-consuming vice and forbidden love. For Evelyn Hugo, her love of money and her inability to be open about her sexual orientation stood between her and the love of her life. Daisy Jones struggles similarly with drug addiction and an obsession with someone who is emotionally unavailable to her. In terms of the actual storytelling, however, these novels are quite different. Daisy Jones and The Six is told entirely in the format of an interview with members of the band and others who were close to them professionally or personally. The reader is made to feel as if they are watching a documentary about the band. While this was interesting in concept, it made for rather dry storytelling after a while, and I think this was the main thing that kept me from being able to rate this as five stars. Perhaps this is down to personal taste and your experience may differ greatly, but I felt I would have enjoyed the story a lot more if the interview format was only a portion of the book and was used to break up chapters in a more traditional narrative style. Billy: Karen was just a great musician. That was all there was to it. I always say I don’t care if you’re a man, woman, white, black, gay, straight, or anything in between – if you play well, you play well. Music is a great equalizer in that way. Karen: Men often think they deserve a sticker for treating women like people. Gender played a really interesting role in this novel, particularly in terms of respect and power struggles. Daisy Jones struggles to be taken seriously when she is starting out as a solo artist. She clashes intensely with Billy’s authoritarian style of running The Six when she begins to integrate into their band. Her ultra-feminine style and revealing clothing also get under the skin of bandmate Karen, who has adopted somewhat of a tomboy persona in an attempt to make the men around her take her seriously. One thing really love about Reid’s work is her ability to write realistically flawed characters while still allowing the reader to feel like it’s worth rooting for them. Daisy Jones is stubborn, selfish, impulsive, and narcissistic. However, we have the benefit of understanding her upbringing (or lack thereof) and the interview format of the book also allows us to see the story through the eyes of an older Daisy, who seems to understand these flaws and to have put work into overcoming them. Taylor Jenkins Reid had truly brought these characters and the era in which they were famous to life. While this isn’t my favorite of her books (if you’re new to her work, I highly recommend The Seven Husbands of Evelyn Hugo as a starting point), I do highly recommend it. It’s a fun read and will have you wishing for a soundtrack to go with it. And since Reese Witherspoon is producing a TV adaptation, it sounds like we might get just that. Daisy: I had absolutely no interest in being somebody else’s muse. Thanks for reading! If you’ve read this book, please feel free to share your own thoughts. 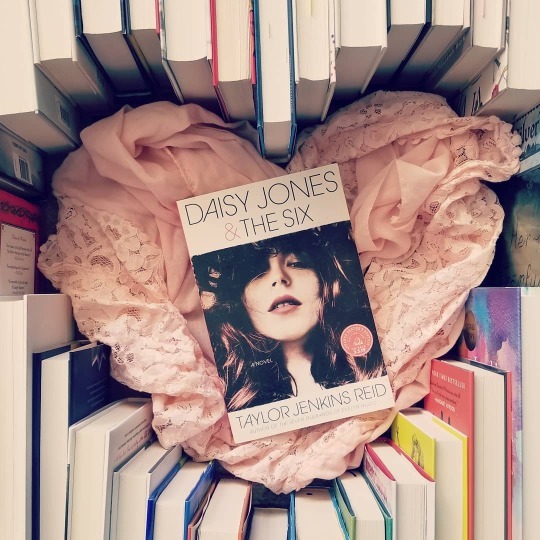 Have you read any books in an interesting format such as the interview style of Daisy Jones and The Six? Let’s discuss in the comments! I know there may be universes out there where I made different choices and they led me somewhere else, led me to someone else. And my heart breaks for every single version of me that didn’t end up with you. This book had me thinking a lot about Dark Matter, by Blake Crouch. …Bear with me for a minute here. I thought it was interesting how two very tonally different books stemmed from the same central idea: the vastly different paths one’s life can take based on a single choice. Specifically, a romantic decision. Dark Matter takes this idea and runs with it, culminating in a dark science fiction story about alternate universes which hinges on the protagonist’s choice to prioritize his career or his romantic partner. 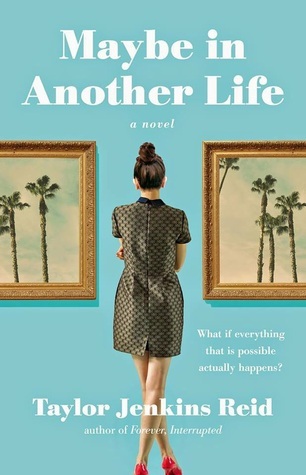 In Maybe in Another Life, Taylor Jenkins Reid uses a nod to the multiverse theory to write two love stories for her protagonist, each mutually exclusive. I think we’ve all spent time thinking about what seemingly inconsequential choices have altered the course of our lives. What tragic accidents have been narrowly avoided? Who are the people who would have changed your life that you almost met? Reid takes Hannah’s decision about whether or not leave a party with her ex boyfriend and runs through the drastically diverging scenarios which emerge. While each story is somewhat engaging on its own, the appeal to this novel is mainly in seeing how one decision can trigger a thousand more, leading to one storyline bearing little resemblance to the other. When you fall in love, it can be difficult to picture things turning out differently. Reid seems particularly interested in exploring the concept of a soulmate. Hannah (minor spoiler here but not really) eventually ends up happy in both scenarios. Who is to say that one is right or wrong? Who is to say that anyone’s perfectly happy marriage is the only way things could or should have turned out? I’m just going to do my best and live under the assumption that if there are things in this life that we are supposed to do, if there are people in this world we are supposed to love, we’ll find them. In time. The future is so incredibly unpredictable that trying to plan for it is like studying for a test you’ll never take. I’m OK in this moment. I loved Hannah as a character. She was a bit of a hot mess, but a self-aware hot mess, and determined to work on herself. It’s difficult not to root for her. I think a lot of Millennials will find her relatable; she’s in her late twenties and struggling with the sensation that things should have fallen into place by now. She should have a stable career, stable relationship, stable life. Instead, she’s untethered and there’s a sense that adolescence is clinging onto her far longer than she’d prefer. Maybe in Another Life was published two years before The Seven Husbands of Evelyn Hugo, and I think it’s fair to say that Taylor Jenkins Reid has grown a lot as an author in those two years. If you’re going into this novel expecting it to be similar in tone and quality to Seven Husbands, you may find yourself disappointed, but taken on its own merit, Maybe in Another Life is cute, sweet, and a worthwhile read. Thank you for reading! Have you read any novels which hinge on the idea of a multiverse theory or diverging storylines based on a single choice? Let’s discuss in the comments! This will be a short review for a short story. My love for Taylor Jenkins Reid has been no secret on this blog. I think I mention The Seven Husbands of Evelyn Hugo every chance I get. So Evidence of the Affair was a lovey surprise today when it popped up on my news feed. This story is told in the form of a series of letters. Two strangers, Carrie and David, begin writing to one another when Carrie discovers that their respective spouses have been having an affair. Carrie discovers the affair when she finds (you guessed it) a stack of love letters from another woman, stashed away in her husband’s briefcase. Neither Carrie nor David are immediately ready to call it quits on their marriages. Unsure of how they plan to handle things, they don’t feel comfortable discussing things with anyone but each other. The result is that the two slowly begin to form an unlikely bond, as they feel like kindred spirits in their heartache. My mother has always told me that I have more opportunities, as a woman of my generation, than she ever had. She made it seem like I had an obligation to use them how she would have. The character development with Carrie was flawless and she was definitely my favorite part of this story. She married young and hasn’t had a career during her marriage, and we watch her struggle to find faith in her own ability to be independent. I was rooting for her to find strength and a sense of self worth from start to finish. Maybe I’m not equipped for short stories, because this definitely left me wanting more at the end. Can we get a sequel? Also, there was a Daisy Jones reference because Taylor Jenkins Reid feels like tormenting me by casually mentioning her book that isn’t coming out until March. Thanks, Taylor. Purchase Evidence of the Affair for Kindle here. Thank you for reading? 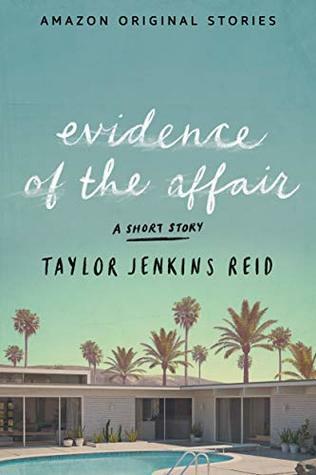 Have you read any of Taylor Jenkins Reid’s work? Discuss your favorite in the comments! To say that I loved The Seven Husbands of Evelyn Hugo would be an understatement. This is one of those books that ends leaving you aching for another page, another chapter. This structure is very effective in calling attention to the wide gap between Evelyn’s reality and the constructed version propped up in the press, where rumors are sometimes reported as fact and vice versa. The Evelyn Hugo that exists in the public’s mind bears little resemblance to the Evelyn Hugo that Monique discovers throughout the story. The book touches on a variety of social issues; racial issues are at the forefront early in the novel. Struggling to find her footing in Hollywood, Evelyn Hugo is subjected to a whitewashing makeover reminiscent of Rita Hayworth. With bleach blonde hair and a new last name to sweep her Latina heritage under the rug, the studio hopes to make her more palatable to the masses. While this wasn’t explicitly forced upon her, it’s clear to her that her success to dependent on going along with it. She seems to be okay with this at first, realizing only afterwards how taxing this will prove to be, such as when she struggles to determine whether speaking Spanish in front of her Latina maid is worth the risk of exposure. This need to hide aspects of her identity foreshadows what is easily the main conflict of the novel. Evelyn spends most of her life in love with another woman and hiding it for the sake of her career and reputation. She is a bisexual character who owns the label “bisexual,” something that is strikingly rare in fiction. She is not an “I don’t like labels” bisexual or an “I went through a phase” bisexual (why straight authors feel the need to write such characters I’ll never understand), she is explicitly bisexual and goes so far as to call out another character for failure to use the correct word. “Don’t ignore half of me so you can fit me into a box. Don’t do that,” she says. Throughout her rise to fame, Evelyn struggles to reconcile her shame, not of her identity itself but of her own willingness to hide it for the sake of success, with her sense of understanding that she’d probably do it all over again. She is hungry for fame, success, the adoration of the masses, and yes, money. Reid has constructed a picture of an intensely realistic, flawed, captivating woman. At moments, it’s easy to feel as if you’re reading the memoir of a flesh and blood person. There are intensely fun passages which can feel like getting the inside scoop on real-life Hollywood royalty, but Evelyn’s unflinching honesty about her own personal demons makes the book so much more than that. This was compulsively readable and completely lovely.